Rifles which have a long range and are very accurate. Shotguns which can be used at short range, firing packets of shot. Machine guns which are fully automatic firearms with large capacity ammunition clips. Sub-machine guns which are smaller automatic weapons using pistol caliber cartridges. Automatic rifles which are long rifles/guns in which the ammunition is stored in a magazine. Historically speaking, in 1934—a year after the Kansas City Massacre that left four law enforcement officers dead, including a Bureau agent—Congress gave FBI agents the authority to carry firearms. In response, the FBI began a robust firearms training program, which has evolved through the years to keep pace with technology and best prepare agents and FBI police officers for the increasing dangers and threats they face carrying out their assignments. 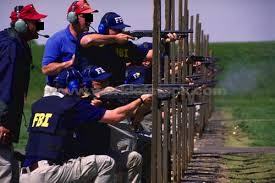 The mission of the Bureau’s firearms training program is to develop and deliver a comprehensive and consistent firearms training curriculum that provides new agent trainees, special agents, and police officers the skills needed to safely and effectively use firearms, if necessary, while performing their duties. Firearms instructors also offer certification and re-certification training to firearms instructors responsible for providing training to agents in the field and state and local law enforcement throughout the country. Directory members can be extremely helpful to anyone seeking information and/or requiring a professional opinion looking for an investigator and/or expert. Using the website’s search feature, visitors need only enter the appropriate skillset or firearms, as well as the geographical area of preference to make contact with an FBI specialist. Retired FBI Agents and Analysts interested in securing a Directory listing and/or a personal email address need only submit an online application requesting membership to join the website.